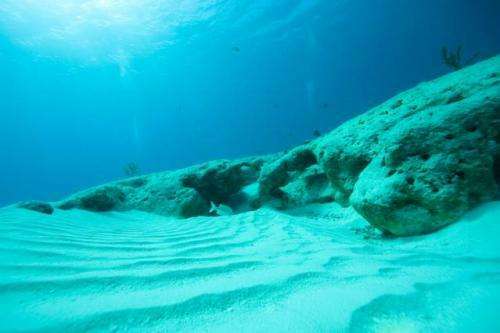 Acoustic-gravity waves—a special type of sound wave that can cut through the deep ocean at the speed of sound—can be generated by underwater earthquakes, explosions, and landslides, as well as by surface waves and meteorites. A single one of these waves can stretch tens or hundreds of kilometers, and travel at depths of hundreds or thousands of meters below the ocean surface, transferring energy from the upper surface to the seafloor, and across the oceans. Acoustic-gravity waves often precede a tsunami or rogue wave—either of which can be devastating. Now a new study by an MIT researcher suggests that these immense deep-ocean waves can rapidly transport millions of cubic meters of water, carrying salts, carbons, and other nutrients around the globe in a matter of hours. Usama Kadri, a postdoc in MIT's Department of Mechanical Engineering, tracked the theoretical movement of fluid caught up in an acoustic-gravity wave at various depths in the ocean, ranging from hundreds to thousands of meters below the surface. Based on his calculations, Kadri found that acoustic-gravity waves can push parcels significant distances, depending on their depth. "Deep-water transport is so vital—not only to local marine ecosystems, but to our global ecosystem and environment—that a cut in such transport will ultimately result in the death of marine life, create regions of extreme water temperatures, and dramatically affect our climate," says Kadri, who has published his results in the Journal of Geophysical Research: Oceans. "To sustain a healthier global ecosystem and environment, there is a need to increase awareness of acoustic-gravity waves and deep-water transport." Kadri adds that such awareness may help scientists devise early-warning systems for seaside communities and offshore facilities vulnerable to tsunamis or rogue waves—monster waves that can come on suddenly, with potentially devastating effects. "Since acoustic-gravity waves are so much faster than tsunamis or rogue waves, successful recordings of … acoustic-gravity waves would enhance current warning systems dramatically, and improve detection by minutes to hours depending on the source location," Kadri says, "either of which is sufficient to [save] many lives." A gravity wave is generated in a fluid or at the interface between fluids, and is governed by gravity. A common example is an ocean surface wave. Acoustic waves, by contrast, propagate through longitudinal compression. For example, sound travels by vibrating and pushing against a fluid medium. Unlike in gravity waves, compressibility dominates acoustic waves, while the effect of gravity is negligible. For those reasons, Kadri says, scientists have generally studied either sound waves in the ocean from a purely acoustic perspective, or surface waves in an incompressible ocean. Kadri modeled the behavior of acoustic-gravity waves in the deep ocean by first considering the propagation of waves in an ideal, compressible ocean, where water volume changes slightly in response to pressure changes. In a two-dimensional model, he calculated the movement of fluid caused by a traveling acoustic-gravity wave at various depths in the ocean. Kadri's equations showed that acoustic-gravity waves may propagate throughout the ocean, up to thousands of meters deep, even traveling along the seafloor. He then looked into whether acoustic-gravity waves may cause water to drift long distances, or if they simply recirculate them back to their original location. Kadri worked the equation out for acoustic-gravity waves at various depths in the deep ocean, and found that these waves can transport water at a velocity of a few centimeters per second. Such waves, Kadri estimates, can therefore transport millions of cubic meters of deep water per second. According to these results, acoustic-gravity waves may be "major players," Kadri says, in transporting water and producing currents in the deep ocean. Such waves may be instrumental in carrying plankton, algae, and bacteria across the oceans, as well as in delivering essential nutrients to sedentary marine organisms. Knowing the properties of acoustic-gravity waves may also help researchers develop early-warning systems for potentially devastating ocean events, such as tsunamis and rogue waves. Toward that end, Kadri is continuing his work to develop predictive computations that can analyze acoustic signals for fast-traveling acoustic-gravity waves—a precursor to tsunamis. Jerry Smith, a research oceanographer at the University of California at San Diego, says a striking contribution from Kadri's research is the finding that surface waves have an effect on deep-ocean waves. "The most significant finding in this particular paper is the contribution to deep-ocean transport," says Smith, who was not involved in the research. "This has not been appreciated before. Since these acoustic-gravity waves can be generated by nonlinear interactions of ordinary wind-waves, the contribution to deep transport could be ubiquitous."